One of the Internet’s simplest tools for French language learning is https://www.languageguide.org/francais/. The layout of the site is straightforward and the tools it offers are effective for learning language quickly, without getting bored. There are three main sections on the French Language Guide website. The first is the Pictorial Vocabulary Guide, an incredibly simple and helpful dictionary. 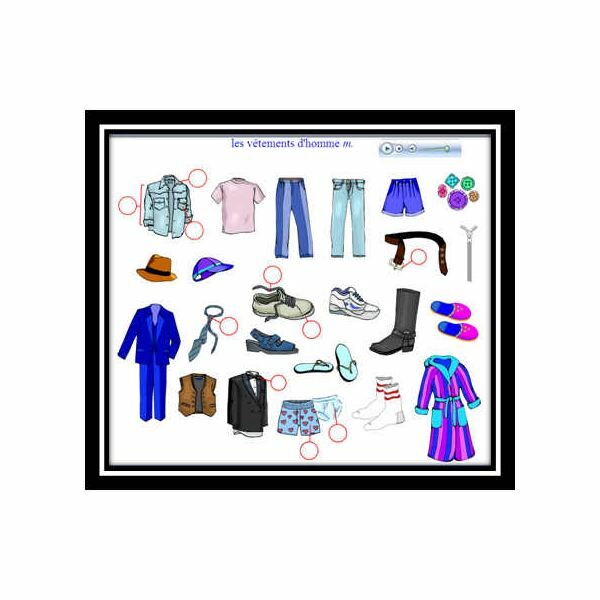 The Pictorial Vocabulary Guide is simple to navigate; it is divided into seven larger groups of vocabulary domains. The vocabulary groups build from simpler to more complex domains. When you click on any particular domain within one of the groups, a new page will pop up, displaying pictorial representations of the vocabulary to be taught. For example, the les vêtements d’homme, when clicked on, will open a page displaying images of men’s clothing items. As you scroll over the pictures of the clothing items with your mouse, each word will automatically be pronounced in French. There is no need to download any sound files: they are directly embedded in the page and activated at once when you scroll over them. As you scroll over the item, you will also see a small box appear with the written form of the French word. This method is wonderful, as it allows you to quickly and easily see a picture, see the written form of the word, and hear the correct pronunciation of that word. Since the vocabulary is separated by domain, you can easily choose which group of words you want to learn and tackle that domain. The section division of the French Language Guide site is the Grammar division. At the top of the Grammar page, there are links to a Grammar Introduction and to a Pronunciation section. Both these sections–Grammar Introduction and Pronunciation–are well organized with subdivisions and are extremely helpful. They describe the basics of French grammar and the pronunciation of all the sounds in the French language, supplementing the informative text with clear audio files. Just as in the Pictorial Vocabulary Guide, you need only scroll over the French words to hear them pronounced: no file downloading is required. After the introductions, the grammar section offers four areas of grammar with a number of lessons in each area: verbs, miscellaneous, pronouns and adverbs. Click on one of the lessons in any of these four groups; Relative Pronouns, for example, and you will open a page that explains in detail how that particular grammatical concept works in French. As usual, the clear written text is supplemented by scroll-over-activated audio files, making it easy to learn and remember French grammatical concepts. In learning a new language, it is essential to learn how the language functions not just in words, phrases or sentences, but at a higher discourse level–particularly the narrative level. Until you are able to understand the read and spoken flow of a story in a foreign language, you don’t really know that language. That is what makes the Readings section of this website so useful. This page offers beginning readings (each rated "easy," "medium," or "hard") as well as advanced readings. If you click on a particular reading/story, such as Deux Amis, you will open a page of text that is accompanied by an audio version of the story. Many of the vocabulary words in the story will be underlined with a small dotted line; when you scroll over these particular words, you will see a small pop-up box that gives an English definition of the word, along with example sentences in English or French. Overall, the French Language Guide is a fabulous resource to utilize in your self-directed French language learning. It is not comprehensive, of course, but few language resources are. But the help it offers is straightforward, easily accessible, and effective in that they employ both readable and audible content. Use this site faithfully, and your ability to use French vocabulary and grammar will be greatly enhanced.